How To Translate Your Engagement Ring Visions Into The Jeweler's Language? Home » Engagement Ring Tips » How To Translate Your Engagement Ring Visions Into The Jeweler’s Language? If you have a clear about your engagement ring, let me congratulate you first. Picking the right engagement ring is a choice that comes with many responsibilities. But, you can steer clear if you know how to put your simple definitions and desires for the ring shape, size, stone, color and so on into the language of the jeweler. So, this is a post to help you out just do that! Let me be honest, most people don’t have an idea about their engagement ring. Either they go for the one that catches the eye in a few minutes or keep getting the wrong one. Don’t get a wrong engagement ring, instead ask your questions about the engagement ring in the comments. Our experts will clear your doubts if they aren’t described already! You want your diamond to be square shaped with straight lines than the curves. Now how do you put this in your jeweler’s language? To start with, there are varieties of the shape you are referring to. It could be any of the below. Click here to read about 10 types of diamond shapes right away to choose the best shape for your dream engagement ring. Do you know her birthday? Then, a brilliant idea for crafting the engagement ring is with birthstones. There are 12 birthstones mainly, but for each zodiac, there is a collection of birthstones you can choose from, for making the engagement ring. The question you need to ask the jeweler is about center stones. Refer to this book on birthstones, if you want to learn more. Choosing the metal is a decision you need to make early. Do you want the ring in rose, yellow or white color? In yellow, you can choose from 10K, 14K, 18K and 22K gold, the same as rose and white gold. As the karat purity goes down, the price of the precious metal also goes down. Platinum has one purity level and price. What you’re talking about when you’re thinking of the diamonds suspended in between the metal claw on the ring is a setting called Invisible tension setting. It requires high pressure, so ask the jeweler if they can do tension setting for your ring. Click here to know more about tension setting for engagement rings. Engraving the ring is a good idea, but we suggest you do after you give the ring. 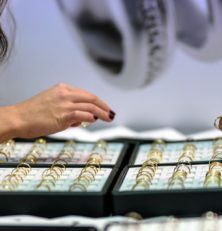 Often, an engraved engagement ring is denied refunds and return warranties. If you’re good for it, you need to decide what the engraving should say. Do you want your names? Date you met? Date of your wedding? Initials? Your favorite quote and so on. When you want a clear or white diamond that does not change color under different lights, you are referring to fluoresce. If you have a colored diamond you bought for cheaper rates, a faintly fluorescent diamond can make it appear white. There are three degrees of fluorescence- very strong, strong and faint. Read all about fluorescence here. What if she doesn’t like the stone or later in life you want to change the diamond? There is a policy called trade up or upgrading. It lets you exchange the ring and get another fitting one in case you feel like the old one doesn’t belong anymore. Read all about the trade in the guarantee or upgrading policy of diamond sellers here so that you ask the real questions. So, now you’ve got all the ammo you need to go to a jeweler and get the ring of your dreams to propose to her, right? Finding her ring size without giving away the proposal is a plan that needs building. Here’s our post on sneaky ways to find out her ring size.